TA-65 is a natural supplement without any active ingredients added. 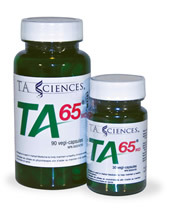 TA-65 supplement is distributed only through healthcare providers as a Nutraceutical. Telomerase-Activating molecule of TA-65 is highly purified through a proprietary extraction process from the Chinese plant Astragalus Root. TA-65 has been proven by outside, 3rd party laboratories to activate telomerase. Telomerase lengthens telomeres and longer telomeres allow cells to continue to divide and replicate longer. Telomerase can be turned on with the nutraceuticals TA65®. TA65 activates telomerase in certain cells and lengthens telomeres and or slows their rate of loss. This allows cells to live longer in a more "youthful" state. Please note that while TA-65 starts to work immediately, most people using it will start to feel and see significant benefits after a period of 6 months. Telomeres are noncoding repetitive DNA sequences (TTAGGG) that protect the ends of linear eukaryotic chromosomes. In humans, a shelterin complex of 6 main proteins binds telomeres. Both the structure and the length of telomeres are important for cellular integrity. The telomeres are thought to prevent the cell’s damage response mechanisms from recognizing the ends of linear chromosomes as double-stranded DNA breaks, including those arising when chromosomes are damaged by stresses such as ionizing radiation. Interfering with telomere structure or length can lead to end-to-end fusions between chromosomes, chromosome instability and abnormalities, and cell division problems (cell senescence, cell death, or cells becoming cancerous). In the body, most cells are unable to maintain telomere length from one division to the next, as the DNA replication machinery is unable to fully replicate the ends of chromosomes, leading to telomere shortening every time cells divide. Once a critical point—the Hayflick limit—is reached, most cells exit the cell cycle and undergo cell senescence. However, a small proportion of cells are able to re-enter the cell cycle, and this is usually associated with the lengthening of telomeres and the expression of telomerase, an enzyme directly involved in telomere formation and maintenance. Bodnar et al. have shown that forced expression of telomerase prevents telomere loss and growth arrest of normal human fibroblasts in culture and is sufficient for telomere lengthening and cell immortalization (extended lifespan). While most cells do not express telomerase, some cells do, such as stem cells, cells of the germ line, and 85% of cancer cells. Such cells are therefore able to maintain telomere length and structure through a large number of cell division cycles. Dr. Autexier explained that many characteristics of natural aging in humans are related to a decline in processes that require continuous cell renewal, or to defective safeguard mechanisms that prevent the occurrence and survival of cells with genomic abnormalities. These include declines in immune and bone marrow functions, skin thickness changes, reduced wound healing capacity, structural changes in epithelial tissues, loss of fertility, and increased incidence of cancer. Research now suggests that loss of telomere integrity is one of the key mechanisms that drive the aging and age-related pathologies. Dr. Autexier described that premature human aging syndromes, such as Ataxia Telangiectasia, Werner Syndrome, and Dyskeratosis congenita (DKC), share phenotypic similarities with the normal aging process, such as cataracts, osteoporosis, hair graying, and neurodegeneration. These syndromes are associated with defects in genes implicated in the maintenance of genomic and telomeric integrity. DKC phenotypes first present in tissues that undergo constant cell renewal, such as the gut, the epidermis, and the bone marrow. Patient populations with the autosomal dominant form of the disease demonstrate shorter telomeres, earlier disease onset and more severe symptoms with each successive generation. These results are consistent with a defective telomere maintenance process. The relationship between defective telomerase activity and the aging process was confirmed in the mTR knockout mouse model. Although these mice are viable, successive generations exhibit progressive shortening of telomeres and decreased fertility (the 6th generation being infertile).10 Interestingly, these mice also present reduced wound healing, hair loss and graying, reduced body weight, intestinal villi atrophy, bone marrow failure, and an increased incidence of cancer.